Cordoba, capital of the province of Cordoba in Andalucia, was an Iberian and Roman city in ancient times where you still find impressive architectural reminders in the old town. The first trace of human presence in the province of Cordoba are remains of the Neanderthal man, dating to 32,000 BC. In the 10th and beginning of the 11th century it has been estimated that Cordoba was one of the most densely populated cities in the world. 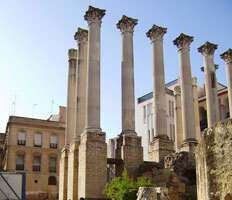 The summers in Cordoba have the highest maximum temperatures in Europe, sometimes exceeding 40ºC. Cordoba has the second largest Old Town in Europe, and the largest urban area in the world to be declared a UNESCO World Heritage Site. A few of the most important historical buildings in the old town of Cordoba are: the Great Mosque of Cordoba, the Roman temple and the Roman bridge. The Cathedral and former Great Mosque of Cordoba (Mezquita-Catedral) dates from the year 600 and was originally a pagan temple, then a Visigoth Christian church, before the Umayyad Moors at first converted the building into a mosque and then built a new mosque on the site. 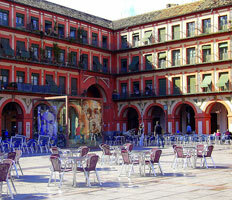 Near the mosque/cathedral you will find the Jewish Quarter, which consists of many irregular streets. 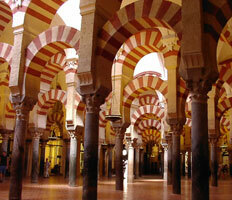 In this area you will find the Cordoba Synagogue which is a historical place of worship built in 1315. Down by the river "Guadalquivir" (Spain's second largest river), are found a series of mills used by the Muslims to grind flour. The Roman walls surround the large Old Town of Cordoba and contain three gates: the Puerta de Almodovar, Puerta de Sevilla and Puerta del Puente. These three are all that remain of the 13 gates the city once had. Parks and Gardens: the Cruz Conde, Botanical Gardens and Zoo are all near each other, while the Alcazar Gardens, Duque de Rivas Gardens, Victoria Gardens, Juan Carlos I Park and Asomadilla Park are also ideal for an evening stroll. 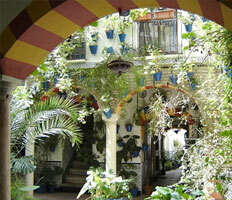 There's a lot more to discover in Cordoba, which makes it one of the most intriguing cities in Andalucia. 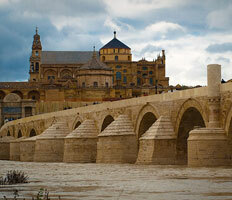 Convinced by Cordoba and planning to pay it a visit? 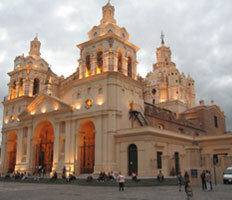 Use the form in the top of the page to find out our prices on cheap airport private taxis to Cordoba. Starting your holiday simply couldn’t be easier.